First, I would like to thank Teri from Images by T. Dashfield and Steve from Steve Allen Photography for nominating me. Both of whom write about a variety of topics are quite humorous and a joy to read. Indeed I am humbled. Second, I am supposed to list seven things about me. We have two lively Terriers to share our lives with. The male Terrier is the girl terrier’s uncle. We call them our puppies, although they are several years past that stage. I love them to pieces. One of my favorite foods is Lasagna…I could eat the whole casserole. I love boats…especially wooden boats. Small or large it doesn’t matter. Our jerk next door neighbors moved this weekend!!!!!! YAY YIPPEE YA HOO. And we met the new neighbors and they are great. YABBA-DABBA-DOO! Inclement weather is my thing. Heard it said once that there is no such thing as bad weather…it’s just bad clothing. Even though GPS is in both vehicles and on the cell phones, I still prefer to do things the old way with map and compass. Because I am obsessed with maps. 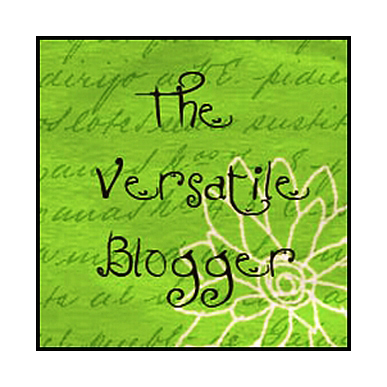 There are so many good Blogs out in the WordPress world I am sure I left some out. No offense was intended…there are just to many to list. Thank you again for thinking of me. By now, you have probably noticed that I love to photograph the splendor of the fall season. Often I will gravitate to the traditional scenics, trees and the bounty of the harvest season. Sometimes, a diversion from the obvious seasonal topics is necessary. Probably because I am in the mood for something a little different. For me, a good diversion is to play around with various photographic techniques, camera settings and lenses. For example, I will adjust the white balance to fluorescent or cloudy when shooting in full sun or at dusk, just to see the effect it may have on color rendition. Another technique is to zoom in or out on your subject with a zoom lens while tripping the shutter. This makes the object appear to be streaking towards you. This is relatively easy to do…it’s just a timing thing…and your subject can be anything you want. I used this technique for the image in this post by using my zoom lens, cable release and the camera mounted on a tripod. You can try the same technique. It’s fun. Set your camera to the lowest ISO that you have available. Using slow shutter speeds is the easiest way to master this technique. Adjust your camera for a proper exposure of 1/30th of a second or slower. By closing down the aperture to F11 or smaller you should end up with a slow enough shutter speed. Focus on your subject with the lens zoomed out. While zooming in on your subject, trip the shutter with the cable release. It may take several tries before you get a result you like, but just keep playing until you get there. Then try another subject and see what kind of effect you can produce. It doesn’t matter what the subject is because you never know what the effect will be. 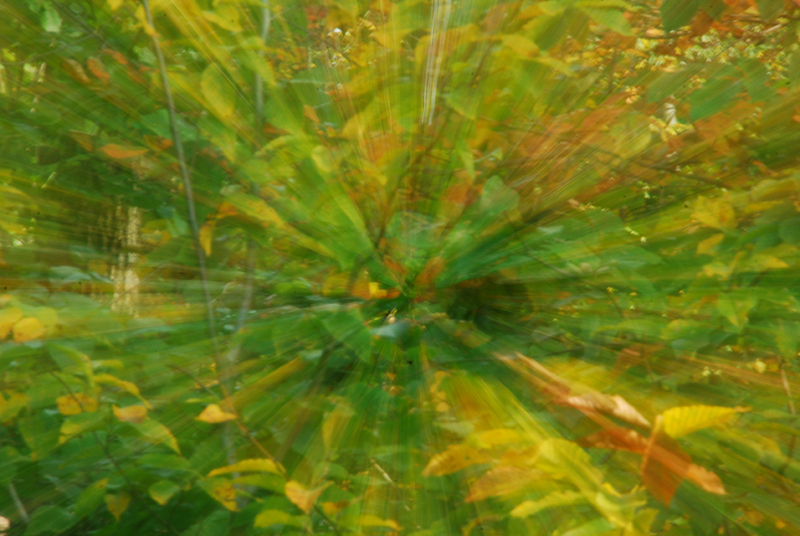 That’s the beauty of digital photography…you can see the results right away. And if the results aren’t what you were looking for, just delete the ones that didn’t work and try again. Play around with color, shapes and textures. Betcha you won’t be able to stop yourself! There have been on-going discussions, debates, arguments and disputes regarding shooting in RAW vs. JPEG format since these options have been available. These disagreements will probably go on for some time because of the advantages and disadvantages to both formats. RAW format can be compared to black and white negative film, as both require processing to produce the final image. RAW format requires processing outside the camera with software, while black and white negatives require chemical processing in a traditional lab setting. A JPEG format is like positive color slide film. Your camera creates the JPEG format, just as the lab chemically processes the color slide film. Some photographers like to shoot in RAW format because it affords more flexibility in controlling color, exposure, white balance and contrast, which can later be adjusted with software. And it is important to them to have as much data to work with when processing the file with software. RAW files do take up a lot of space on data cards, as compared to JPEGs. However, spending time in the digital darkroom works for those amateur and professional photographers who prefer to shoot RAW. Other photographers like to shoot in JPEG format because of the convenience it affords. They set up their cameras to the white balance, exposure, color balance and contrast of their choice. After taking the photograph, the camera’s processor takes over the job and converts the file to JPEG format using its sophisticated algorithms, then compresses the file. More files can fit on data cards in this format and photos are ready for immediate use or additional tweaking with software as needed. Some cameras allow you to shoot in both formats at the same time so you get the best of both worlds. You get a RAW file if you want to process the file yourself and a JPEG for immediate use. This method requires good file management skills and more data cards because of file sizes. Many professional and amateur photographers are now shooting exclusively in JPEG because the format suits their needs. They feel they get the exposure right when they push the shutter button, eliminating the need to shoot in RAW. Which allows them to spend more time in the field, rather than spending time in a digital darkroom. Shooting in RAW vs. JPEG is simply a matter of personal preference. You can process your files yourself or have the camera take care of that task. Your choice. I know…I know…I know…another fall scenic. However, I felt it would be a good illustration on the topic of balancing composition. In this scene, I wanted to emphasize the stunning maple tree in the foreground against the vibrant green grass, while maintaining balance within the composition. By positioning the two feature orange maple trees on either side of the frame, balance is created. I used a zoom lens at various focal lengths to adjust the framing and to compress the foreground and background elements of the scene. 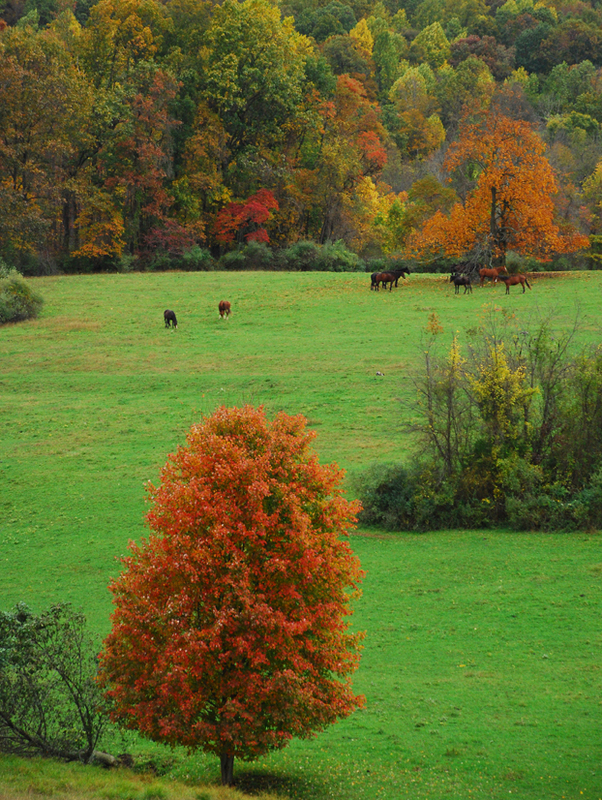 By composing the photograph in such a way, the viewer’s eyes are led through the scene to discover the horses under the tree in the background, making the image more engaging. A couple of days ago, we woke up to a pouring rain, which lasted for a good part of the day. It really was more like a monsoon. 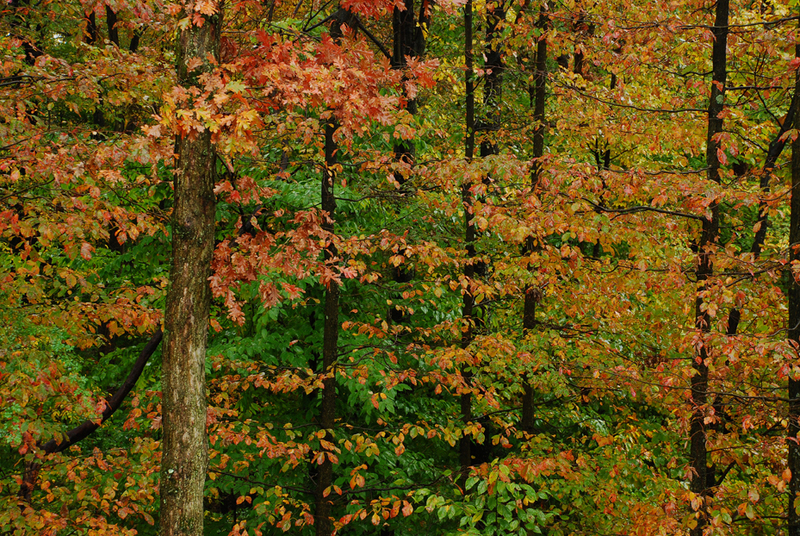 Early in the morning, I looked out the sliding glass door and the wet leaves were saturated with color from the rain. I couldn’t pass up the opportunity to photograph the display. Out came the tripod, camera and rain sleeve. I was able to take quite a few photos before it changed from rainy and breezy to rainy and blustery. I am glad I was able to photograph the woods before a lot of the leaves were blown away with the wind. We are fortunate to live in a place that is surrounded by a variety of trees. From russet brown to crimson reds, to amber oranges and yellows, and multiple shades of green…the woods is abundant with color. Fall is my one of my favorite times of the year to be outside photographing the vibrant colors that nature produces. The varied colors of the trees and shrubs are obvious subjects. And I do enjoy photographing the larger landscapes. But I also like to find vignettes that capture the essence of the season. Whether it be a small branch with a few brightly colored leaves or a collection of nuts on the forest floor. The smaller details provide as much pleasure and interest for me as do the grand vistas. Wandering around our local orchard the other day, I found several contenders that would represent the season on a smaller scale. 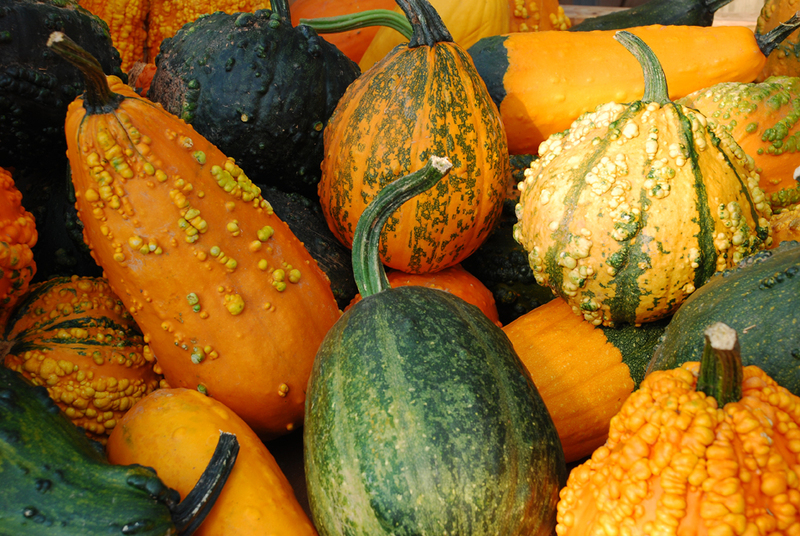 One of which was a wooden crate overflowing with decorative gourds. The crate was not in direct sunlight, which was a benefit since it was midday. Because the colors were not washed out, and there was good detail in the shadows, the contrast of colors and textures was more apparent. Fall is such a wonderful time to be out and about. The air is crisp, the colors are stunning, and there is a bounty of subject matter. Late last week, the morning dawned with thick fog and drizzling rain. I was hoping to capture a few fall landscape shots with the morning sunlight breaking through the fog as it lifted. I drove around the lower elevations, drove up to higher elevations and even in-between. In some areas, the fog was so thick that visibility was less than 30 feet. I realized shooting grand vistas of fall color in a misty fog was not going to happen. So I decided to call it a day. Time to change my plans and photograph outdoors on a smaller scale. My neighbor who owns a landscaping company always has unusual plantings along his property at the woods edge. The lucky guy receives unwanted or unneeded plants of all varieties from his customers. It is a pleasure to walk or drive by his property…you never know what you will see. With my neighbor’s permission, I have photographed the various plants and flowers there before. 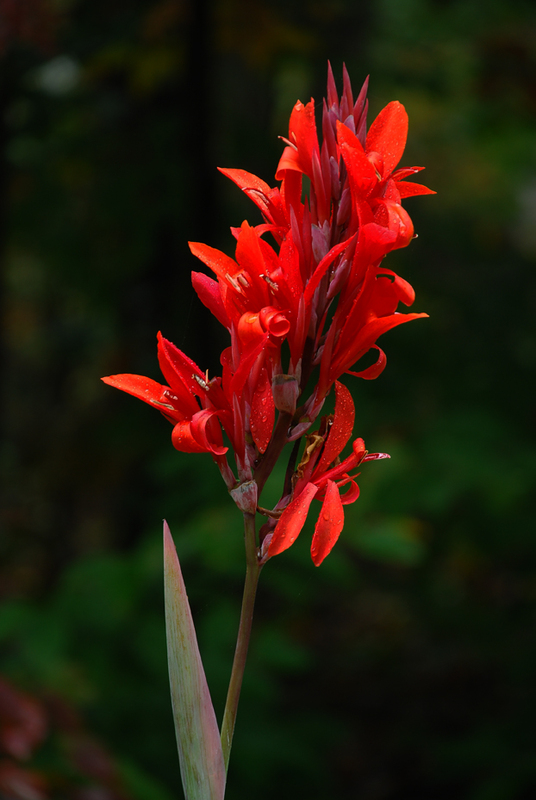 On this day, the Canna’s growing among the woodland plants were stunning. I set up the camera and tripod at a favorable spot then watched the fog rolling up the street. When the fog would clear for a moment, I would pull off the lens cap and fire off a few shots. I repeated this process as I moved to each new location, being sure to keep the lens covered as protection from the misty fog. The colors really popped in the soft overcast light. 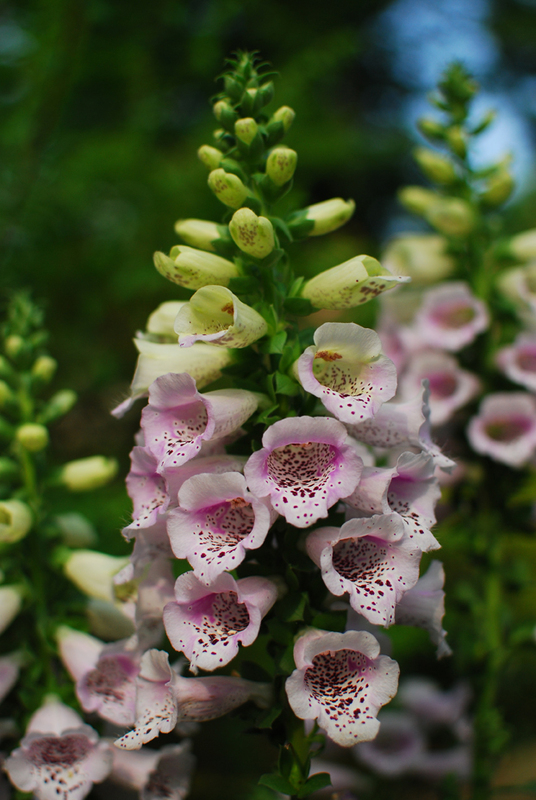 I had to use a bit of flash to freeze the motion of the flowers due to the light puffs of damp air and fog. Even though my plans for fall landscape vistas were dashed due to fog thick as pea soup, I managed to have a successful outing. Turns out the fog never did completely clear that day.